Significantly reduce your transfer chute maintenance and at the same time significantly improve transfer chute reliability and productivity. That's Gulf StallFlow Technology. Better design and thinking provides the next 'step' change improvements required to generate incremental production increases from materials handling conveyor assets by identifying and eliminating bottlenecks. Gulf's proven StallFlow Transfer Chute. The transfer chute loads with a good surcharge angle ensuring maximum system capacity without spillage and with minimal dust generation. Extends belt life as it always soft loads with minimal material boil and no entrapping of ore along the skirt lines. Extreme conditions countered by extremely good design thinking. The design of Gulf transfers chute is based on designing to extremes, with an industry leading understanding of how sub (-) 1mm material flows. The significance of -1mm material is that this is where the surface interactional forces start dominating the way the material flows and behaves as against the physical properties of the ore. Right down into the sticky nitty-gritty. Typically known as wet, sticky clay ore, the -200 micron material and more likely -20 micron all contain water. How these size fractions interact (cohesive, adhesive forces) and achieving a balance between ensuring that we can control the flow of the product without blocking the transfer chute, can only be achieved in transfer chute design by understanding and being able to simulate, through empirical testing, these interactions. That's our specialty at Gulf. Reduce costs and increase production with Gulf StallFlow Technology. 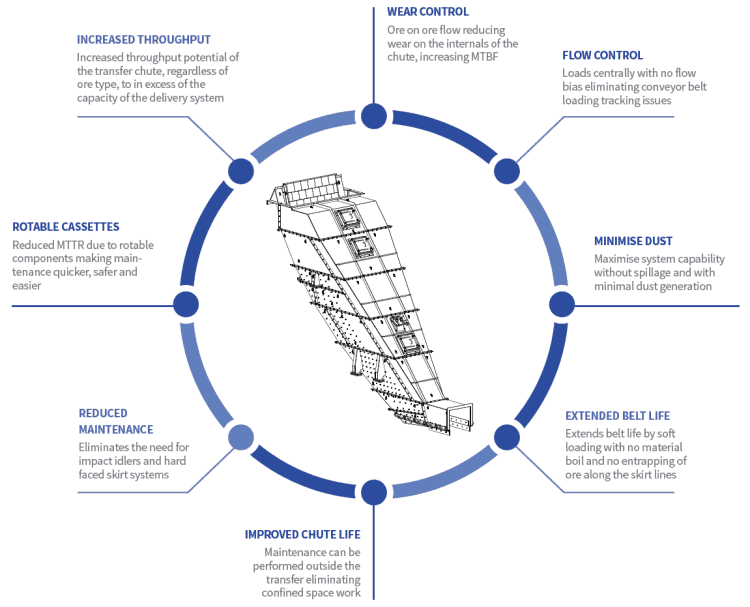 Sites managing cohesive ores have utilised this transfer chute technology to significantly increase production while at the same time greatly reducing operating and maintenance costs. In the 30 years of transfer chute development everyone has developed fixed ideas. Essentially high volume conveyors originated from the grain industry and then moved into sized washed coal. In terms of the way they worked, they were facile – uniform in size and the materials flowed predictably. Universities started looking at this information and started using models to design bins and hoppers and then developed their models for transfer chutes similarly. When the principles were applied to more complex materials we found that performance outcomes were seriously compromised. It’s all way more technical than was thought. Discrete Element Method software (DEM) was first applied to transfer chutes in the early 1990’s. The mathematical complexity of granular flow is extreme and DEM assumed many things. Today we seriously question and in fact substantially challenge many of these assumptions as being invalid. With DEM the design software of preference for transfers, this is a significant issue. How right are the right angles? But the flow complexity of granular materials is much more complex and these angles can be totally irrelevant depending on the particular design. It’s design thinking based on unclear assumptions. At Gulf we looked at site problems and using reverse engineering, developed an improved understanding of granular flow mechanisms that led to the development of our StallFlow Technology. It takes on board many variables and looks at everything holistically, bringing about new and improved design thinking to all aspects including transfer chute design. Cost Benefit Summary: significantly reduced maintenance, significantly reduced downtime, significantly increased production and reliability.